Consists of: two - quart waterers, two-one pound chick feeders, 1 brooder guard, 1 single bulb brooder complete with infrared bulb, and a brooder thermometer for keeping the correct temperature. Perfect for all day-old poultry except quail. IMPORTANT: To avoid possible leg problems, remove the papers after the first day for heavy breeds and meat birds and after the third day for lighter breeds. Please Note: We strongly recommend using the brooder lamp as instructed per the manufacturer's instructions. 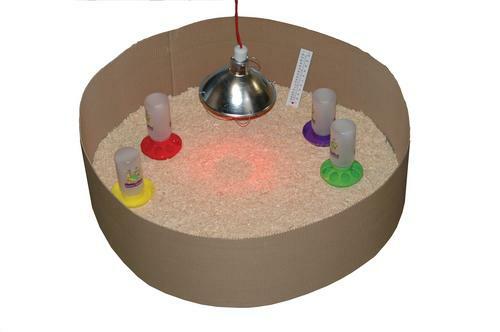 Brooder lamps and bulbs can be used for heat sources. As with any heat source, proper and constant monitoring of the heat source is highly recommended. Any heat source that can not be monitored should be unplugged. How long does the starter kit work for the same group of chicks? The starter kit will accommodate up to 50 chicks, for approximately 4-6 weeks. The chick starter kit, how many chicks is it designed for? The chick starter kit (sku #5MSK) is ideal for 50 chicks. a great start for beginners!This was so easy to use for someone like me who had no idea what I was doing!